Full Sail Graphics & Marketing in Huntington Beach is proud of the city in which we live and enjoys giving back to the community in any way we can. We deeply value service and donations that help to make Huntington Beach an even greater city! Peter Brunner, the Owner and CEO of Full Sail Graphics, has been involved with the Rotary Club of Huntington Beach for quite an extended period of time. Rotary International is the world’s premier service organization with over 1.2 million active members in 34,000 clubs worldwide. They emphasize the pillars of friendship, integrity, and the notion of “service above self.” The Rotary Club of Huntington Beach is a fairly small, but incredibly active chapter with several community service projects organized each year. Most recently, the Rotary Club of Huntington Beach presented a check to Collette Wright [pictured to the left]. Wright serves as the acting principal of Sun View Elementary school. The eighteen hundred dollar donation will provide the funding necessary for the school to purchase ten brand new Chromebook to be utilized inside of the classroom. Technology in the classroom setting provides students with innovative new ways to their education. 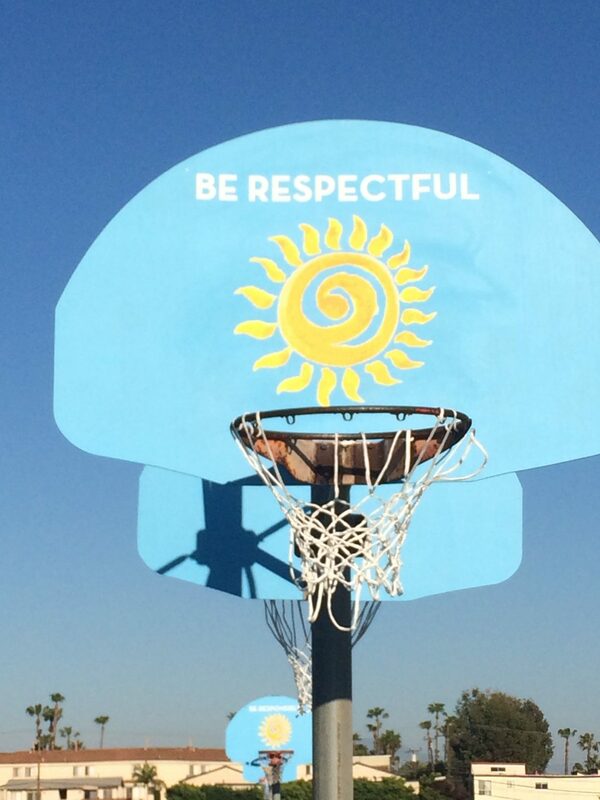 The Rotary Club also painted the backboards for Sun View Elementary School with graphics that were donated byFull Sail Graphics & Marketing. Kim Alvis of Sun View Elementary was thrilled to arrive at work “to find some absolutely beautiful backboards!! Thank you to [Peter Brunner] and the Rotary Club for being such amazing supporters of our School! We are very appreciative!” Sun View Elementary is the adopted school of the Huntington Beach Rotary Club and Full Sail Graphics was honored to help beautify their campus. With over 50 years of combined experience in graphics and marketing, the Full Sail Graphics & Marketing team is confident that we will deliver quality graphics on time and on budget. If you are looking to brand your business or need any type of large format graphics printed, please feel free to give us a phone call at (714) 451-8428 or visit our website at //fullsailgraphics.com.